With all of the hot stove league action coming at us this off-season, it’s almost like baseball never stopped. The Giants had barely fitted their rings (man, what a fun ride that team was down the stretch!) 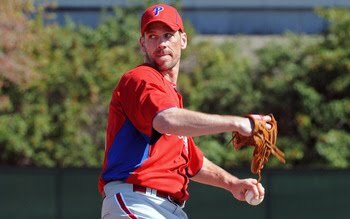 when talk turned to Cliff Lee, Carl Crawford, Zach Grienke and a host of other rising or peaking talents who were seemingly destined for the MLB holy triumvirate of Boston, Philly and New York (and no, I don’t mean the Mets). Now, with the arrival of spring training, it’s time to start looking at the results and venture into those favorite waters of pundits worldwide. In short, it’s time for some early predictions. NL East: Is there really any question here? The Phillies’ rotation ranks among the best in recent MLB history (really, only SF rivals them going into the season). Their unexpected signing of Cliff Lee was the most momentous pickup of the offseason, and has positioned them for a third World Series appearance in four seasons, and the most pressing question headed into the season would seem to be whether or not Philadelphia can crack 100 wins for the first time in franchise history (of course, avoiding a prolonged slump at the plate this time out would help that venture tremendously). Best of the rest? The Braves’ surprising playoff appearance smells of one and done to me (though the first season without Bobby Cox since the Nixon administration does bear some interest), and I’m not impressed by the offseason posturing of any other NL East clubs. Florida might make a wild card push, and I’m curious to see what becomes of the snakebit Nationals (Will we ever again see a genuine Strasmas start, or has their young fireballer already flamed out?). The Mets? Well, let’s just say that most of the pressure in NY should fall squarely on the Yankees this season. NL Central: Will the real Cardinals please stand up? With All-World Albert Pujols’ contract status still up in the air, will the redbirds step up to reclaim their division? I think so. It’s not a strong feeling. I wouldn’t go “all in” on it, by any means. It’s just that they were rolling along nicely last season before an unexplained late-season swoon gave Cincinnati a shot at the postseason, and I somehow think that they’re going to bounce back. Speaking of the Red Stockings, is anyone convinced that last year was more substance than fluke? Joey Votto’s the real deal, and they’ve got a couple of solid hurlers in the rotation, but the chances that they build upon 2010’s breakthrough appear to be slim and none. Still, an outside run for that wild card slot isn’t beyond possibility. A more likely challenger would appear to be the Brewers, whom may well steal the division if St. Louis falters. Zack Greinke was a steal and could well put Milwaukee over in what may be their last Prince Fielder season. As for the field… well, it will still be fun to attend games in Houston, Chicago and Pittsburgh. In May, at least. Chicago could surprise us all with a decent midseason run, but don’t be fooled if they do. The Cubbies will be at home, watching the playoffs as usual. As will the Astros and Pirates. Book it. NL West: What’s more likely, the Giants repeating their unexpected title run, or the Padres taking the division title race down to the wire again? I’d hazard the former, as the loss of Adrian Gonzalez has signaled the end of San Diego’s poorly timed near miss (the front office would have much rather blown up the existing core and started over, but were unable to pull the trigger so long as the club was in contention). San Francisco barely made the postseason, needing a lot of luck and a smattering of assistance in order to qualify on the final day of the season. Still, once there, it was easy to see why the Giants should be a contender for years to come, if only they can add a little pop to their patchwork lineup (does anyone really expect Cody Ross to be more Superman than Clark Kent as a full season gets underway?). With or without another stick, SF looks to be the class of the division, with only the Rockies posing any real threat (their late swoon makes it easy to forget just how close they seemed to stealing the division with two weeks to go). The Dodgers again figure to be more fun off the field than on, though seeing Donnie Baseball in the dugout figures to add some national interest until they fall from contention. Arizona is still in full-on rebuilding mode. But hey, the fun is in the journey. Can’t wait to see how it all turns out in 2011 (though I’m already dreading the late-nights that a compelling playoff matchup inevitably brings to European baseball fans). Up next – a look at the American League! Unbiasedly, I think SF will be a much stronger team this year than last. Their last minute NL West pennant was due to being swept twice by SD and LA in the first half of the 2010 season... a much different team. From Sandoval's performance so far in the Cactus League, should he stay fit and healthy, looks to be a workhorse of offence. But of course any repeat this year will be due to pitching. Even though SF's starters on paper don't quite match the Phils', as seen with the the elimination of the Padres, Braves, Phils, and Rangers last year, you also need a deep bullpen to bail out your ace starters when the water gets too hot. Lead by Brian Wilson, Romo, Casilla, Affeldt, Runzler, and now right-hander Elmer Dessens, not to mention relievers in the farm such as Ryan Verdugo, the Giants can pitch a 20+ inning game FTW if need be. As a fan, hopefully the media will continue to give the edge to any opposing team as it seems SF perform better with a little underdog pressure.